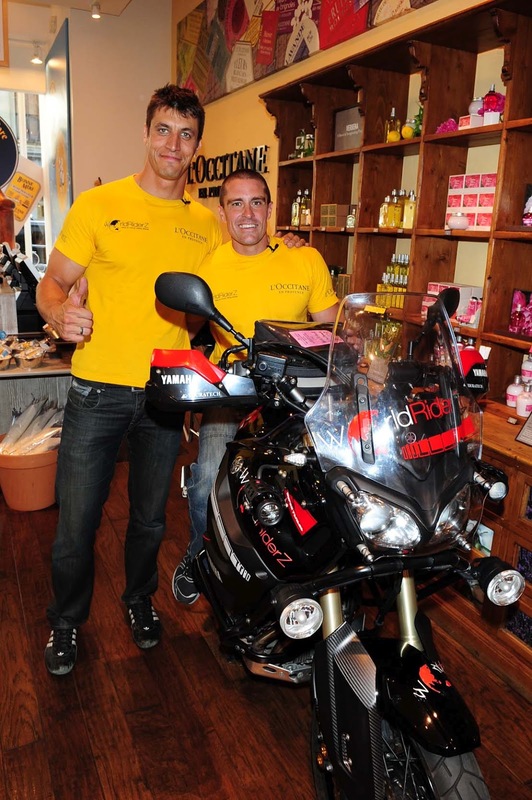 On August 28th, the L'Occitane Flatiron store hosted a shopping event and Refuel and Refresh for WorldRiderZ teamsters Stephane Etienne and Paul Torriero. L'Occitane is sponsoring WorldRiderZ in their round-the-world bike journey to raise awareness and funds to fight Chronic Kidney Disease. For their Flatiron stop-over, Stephane and Paul were pampered with mini-facials and treated to hand massages. During the event, guests enjoyed champagne and macarons while shopping their L'Occitane favorites and exploring new products. The Flatiron boutique was beautifully decorated with Immortelle face care, featuring Immortelle Precious Serum and Divine Cream. I was able to stock up on my own personal favorites like the must-have Shea Butter Hand Cream and the incredibly hydrating Almond Shower Oil. The WorldRiderZ story centers on Stephane's son Ilhan, who was born with severe kidney disease. Stephane along with friend Paul, set out to raise awareness and funds by undertaking an incredible bike journey across 9 countries. The 25,000 km journey has included 11 hospital visits, numerous press conferences and filming a six-part documentary for the Discovery Channel. WorldRiderZ has been welcomed all over the world by key figures such as French Minister of Health Xavier Bertrand, Prince Abdulaziz Bin Salmon of Saudi Arabia, Richard Berry and the Dalai Lama. WorldRiderZ is now setting off on the second leg of their journey which involves crossing France, the UK, Canada and the US, traveling 15,535 miles over a three month span. L'Occitane will also be donating 15% of the daily sales at key stop-off locations throughout Stephane and Paul's journey to fight Chronic Kidney Disease, including the London's Covenant Garden, as well as spots in Toronto and New York City. Thank you to L'Occitane for having me take part in an amazing event and cause!